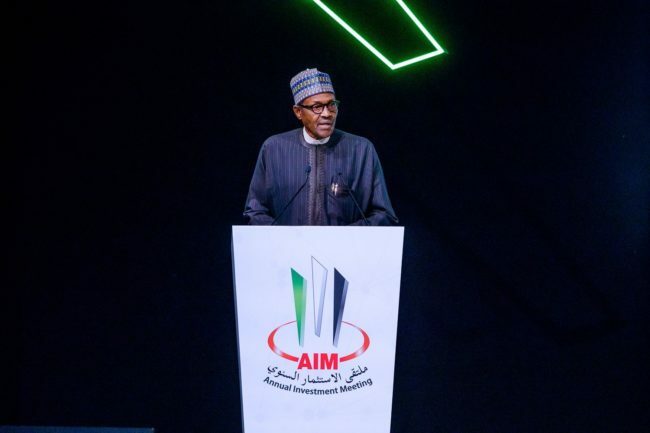 President Muhammadu Buhari Monday became Nigeria’s marketer-in-Chief as he tried to lure no fewer than six different groups of investors to the country. Buhari made the sales pitch at the sidelines of the Annual Investment Meeting in Dubai, United Arab Emirates. He had an irresistible message for all the potential investors: Come to Nigeria and prosper. Come and have handsome returns on your investments, within the shortest possible time. One of the would-be-investors was Sheikh Ahmed Al Maktoum, a member of the Dubai ruling family. He is on the board of several companies, both state owned and private. He is interested in establishing a power plant in Lagos, and studies have already been completed. President Buhari also met with Mr Jitender Sachdeva, CEO Skipperseil Group. An integrated energy company with operations in the manufacturing of substation equipment, discussions were on engineering processing, construction of transmission lines and substations for utilities, institutions and industries.